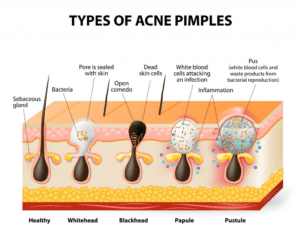 The cause of acne occurs when the pores of your skin become clogged, which occur on the face, neck, back and chest. The over production of skin cells and trapped oil causes bacteria to grow. This causes an inflammatory response in the skin where acne lesions can form. Acne lesions can be categorized as mild, moderate or severe depending on the type of lesion, and may or may not have inflammation present. Another cause of acne is attributed to hormonal changes which commonly occurs in teenagers and may even lead to adulthood. Mild to moderate acne can be small and hardly noticeable, resembling a small white head or black head, or can appear red with a white/yellow center. Severe acne will sometimes become so inflamed that it can produce larger, more painful lesions such as nodules or cysts. These types of lesions are prone to scarring, where professional attention may be needed. A blackhead occurs when the pore opens to the surface and the sebum, which contains the skin pigment melanin, oxidizes and turns a brown/black color. A pustule forms several days later when white blood cells make their way to the surface of the skin. This is what people usually refer to as a “zit” or a “pimple.